Brook Mitchell/Getty ImagesJoe Biden arrives at Sydney Airport with his granddaughters on July 18, 2016. Joe Biden is on a winning streak, as candidates he’s backed have pulled off impressive – and sometimes long-shot – victories. He’s looking to extend that winning streak in Pittsburgh’s suburbs with his support of Democratic congressional candidate Conor Lamb. Some Lamb supporters want Biden to run for president. PITTSBURGH – Former Vice President Joe Biden, on an extended winning streak, is planting the seeds for a potential 2020 run by boosting a surging candidate in the nation’s most-watched special election. Unlike other prominent Democrats like former President Barack Obama and 2016 Democratic presidential nominee Hillary Clinton, Biden has been all over the campaign trail since President Donald Trump took office last year. He’s campaigned for candidates in Senate races, gubernatorial contests, and state-level bouts – even mayor’s races. And in recent months, the candidates he’s been stumping for have been winning. Everywhere. The first major victories came in New Jersey and Virginia, where Democrats Phil Murphy and Ralph Northam had commanding victories for each state’s governorship. In December, a month later, Democrat Doug Jones won a Senate seat in Alabama that many thought was impossible weeks earlier, when Biden was the only major Democrat to campaign alongside Jones. Now Biden is seeking to help Democrat Conor Lamb, a former Marine and assistant US attorney, to an improbable victory in the special congressional election for Pennsylvania’s 18th District. The area, thoroughly Republican, went for Trump by 20 points in 2016. But recent polling has found Lamb with a small lead over his Republican opponent, Pennsylvania state Rep. Rick Saccone. On Tuesday, he joined Lamb for a pair of rallies with just a week left before Election Day. In his speeches, he decried how American politics have become “so dirty” and railed against the Republican tax plan, saying it will be paid for with cuts to Social Security, Medicare, and Medicaid. And he boasted of his ability to work across the aisle on legislation. He fired up a crowd of union members at a carpentry apprentice shop outside of Pittsburgh at the first rally, speaking of how they “built” the nation. 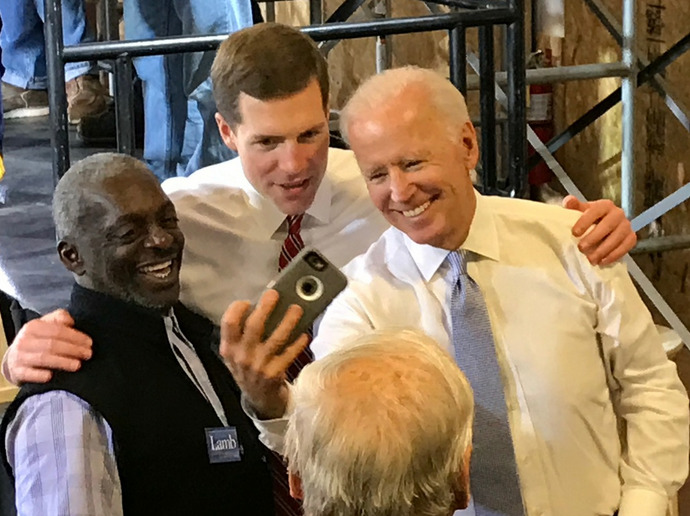 Allan Smith/Business InsiderA supporter taking a selfie with Conor Lamb and Joe Biden. Biden delivered high praise to the young Pennsylvania hopeful. Biden compared Lamb to his son Beau, the former Delaware attorney general who died of cancer in 2015. Speaking along a rope line after the first speech, Biden predicted that another half-dozen Republicans will “say they’re not running again” if Lamb wins next week. Supporters were excited to see the former vice president stump for Lamb in the southwestern part of the state. With speculation abound that Biden will run for president in 2020, many were optimistic he’d jump into the race. Rich Nicola, a 58-year-old carpenter from the district, said he hopes the 75-year-old Biden jumps into the race. Biden didn’t mention his possible candidacy during either of his speeches for Lamb – and he didn’t mention the president by name, either. But the Biden candidacy has been on Trump’s mind. During his joke-filled speech to the Gridiron Club, a charitable journalistic organisation, at its annual dinner Saturday, Trump made reference to “Sleepy Joe” Biden. Trump suggested he would “kick his arse,” referencing a past comment Biden made about wanting to fight the then-Republican presidential nominee. Whether or not he does run, Biden is keeping up a prolific campaign profile. In many races, such as the special election in Alabama and now the one in Pennsylvania, he’s viewed as the only prominent national Democrat who can appeal to the party’s working-class base. “He speaks for exactly what this district is,” Kelly said, calling Biden “Pennsylvania’s third senator,” a nickname the Scranton native held during his years as a Delaware senator. Could any other big-name Democrats come in and help Lamb? Lynn Heckman, a member of the Collier, Pennsylvania Democratic committee, said she didn’t think so. He’s “the only one,” she said.